[Edit 2017-04-20] A careful reader informed me (thanks for that HN user puzzle) that it is no longer required to run in privileged mode to access the GPUs in K8s. I therefore removed a note that previously stated this requirement, and am in the process of updating my Helm charts to remove it as well from there. Over the last 4 months I have blogged 4 times about the enablement of GPUs in Kubernetes. Each time I did so, I spent several days building and destroying clusters until it was just right, making the experience as fluid as possible for adventurous readers. 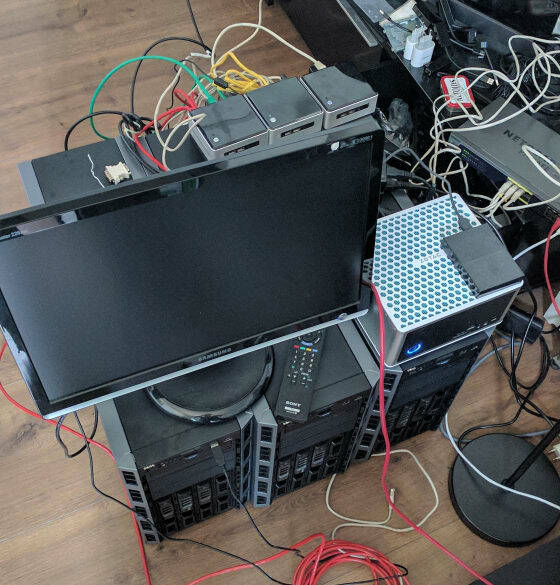 It was not the easiest task as the environments were different (cloud, bare metal), the hardware was different (g2.xlarge have old K20s, p2 instances have K80s, I had 1060GTX at home but on consumer grade Intel NUC…). As a result, I also spent several hours supporting people to set up clusters. Usually with success, but I must admit some environments have been challenging. Thankfully the team at Canonical in charge of developing the Canonical Distribution of Kubernetes have productized GPU integration and made it so easy to use that it would just be a shame not to talk about it. Please don’t mind the cables, I don’t have a rack…There we are! Ready for some awesomeness? Test that the drivers were installed OK and made available in k8s with Juju and Kubernetes commands. Overall, on top of the Kubernetes installation, with all the scripting in the world, no less than 30 to 45min were lost to perform the specific maintenance for GPU enablement. It is better than having no GPUs, but it is often too much for the operators of the clusters who want an instant solution. In case you have a mixed cluster with some nodes with GPUs and others without, only the right nodes will attempt to install CUDA and accept privileged containers. easyrsa/0*                active       idle       0/lxd/0  10.0.201.114                    Certificate Authority connected. kubernetes-worker-cpu/0*  active       idle       1        34.207.180.182  80/tcp,443/tcp  Kubernetes worker running. juju ssh kubernetes-worker-gpu/0 "sudo nvidia-smi"
That’s it, you can see the K80 from the p2.xlarge instance. I didn’t do anything about it, it was completely automated. This is Kubernetes on GPU steroids. Obviously there is a little more to do on Bare Metal, and I will refer you to my previous posts to understand how to set MAAS up & running. This assumes it is already working. Adding the T630 to MAAS is a breeze. If you don’t change the default iDRAC username password (root/calvin), the only thing you have to do it connect them to a network (a specific VLAN for management is preferred of course), set the IP address, and add to MAAS with an IPMI Power type. Adding the nodes into MAASThen commission the nodes as you would with any other. This time, you won’t need to press the power button like I had to with the NUC cluster: MAAS will trigger via the IPMI card directly, request a PXE boot, and register the node, all fully automagically. Once that is done, tag them “gpu” to make sure to recognize them. easyrsa/0*                active    idle   0/lxd/0  172.16.0.8                      Certificate Authority connected. kubernetes-master/0*      active    idle   0        172.16.0.4      6443/tcp        Kubernetes master running. kubernetes-worker-cpu/0*  active    idle   1        172.16.0.5      80/tcp,443/tcp  Kubernetes worker running. kubernetes-worker-gpu/0   active    idle   2        172.16.0.6      80/tcp,443/tcp  Kubernetes worker running. 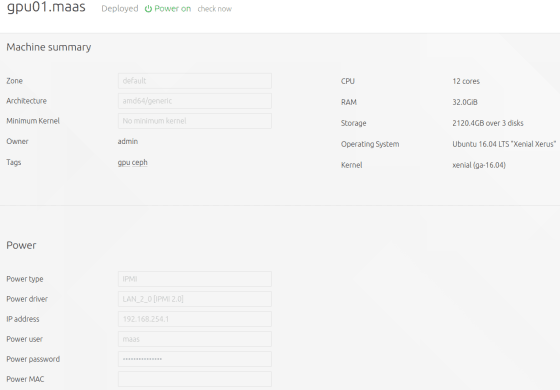 kubernetes-worker-gpu/1   active    idle   3        172.16.0.7      80/tcp,443/tcp  Kubernetes worker running. kubernetes-worker-gpu/2*  active    idle   4        172.16.0.3      80/tcp,443/tcp  Kubernetes worker running. That’s it, my 2 cards are in there: 1060GTX and P5000. Again, no user interaction. How awesome is this? Note that the interesting aspects are not only that it automated the GPU enablement, but also that the bundle files (the yaml content) are essentially the same, but for the machine constraints we set. If you follow me you know I’ve been playing with Tensorflow, so that would be a use case, but I actually wanted to get some raw fun with them! One of my readers mentioned bitcoin mining once, so I decided to go for it. I made a quick and dirty Helm Chart for an Ethereum Miner, along with a simple rig monitoring system called ethmon. Monitoring interface (ethmon)You can also track it here with nice graphs. I really need to work on my tuning per card here! The P5000 and the 1060GTX have the same performances, and they also are the same as my Quadro M4000. This is not right (or there is a cap somewhere). But I’m a newbie, I’ll get better. It’s probably not worth it money wise. This would make me less than $100/month with this cluster, less than my electricity bill to run it. There is a LOT of room for Monero mining on the CPU! I run at less than a core for the 6 workers. I’ll probably update it to run less workers, but with all the GPUs allocated to them. 3 months ago, I recognize running Kubernetes with GPUs wasn’t a trivial job. It was possible, but you needed to really want it. Today, if you are looking for CUDA workloads, I challenge you to find anything easier than the Canonical Distribution of Kubernetes to run that, on Bare Metal or in the cloud. It is literally so trivial to make it work that it’s boring. Exactly what you want from infrastructure. GPUs are the new normal. Get used to it. So, let me know of your use cases, and I will put this cluster to work on something a little more useful for mankind than a couple of ETH! I am always happy to do some skunk work, and if you combine GPUs and Kubernetes, you’ll just be targeting my 2 favorite things in the compute world. Shoot me a message @SaMnCo_23!